We’re always striving to give you the best possible experience from the moment you arrive on Last.fm. It’s important to us that the most interesting content is easy to find and looking sharp. Last week, we released an update with some significant improvements to the user home page, one of the most useful but overlooked pages on Last.fm. The redesigned home page features the same great content, but reorganised and given a much needed facelift. Your recommendations are now featured front and centre, with bigger images and a neat new layout. There’s also a new library section in the right hand column that gives an overview of your personal stats and recent activity. The changes aren’t all on the surface though; your new releases, events, and free downloads recommendations are now better quality, displayed more intelligently (based on your recent listening habits) and programmed to shuffle on each visit to the page. It’s never been easier to discover new music! So, what if you’ve just joined Last.fm? Some of the most exciting changes are only apparent when you’ve got a brand new account. 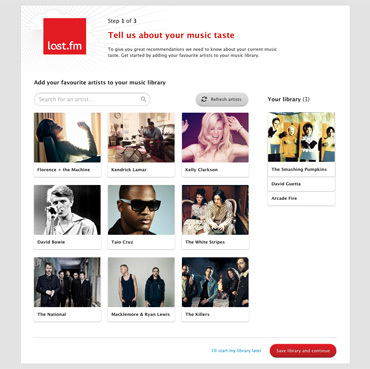 In this case, the redesigned home page helps to welcome you to the world of Last.fm with a simpler design and clear messaging about how to get your first recommendations and start scrobbling. The improvements for new users don’t stop there – we’ve also updated our sign-up experience. Back in April we introduced a new account setup process which includes 3 simple steps. New users are guided through starting their library, setting up scrobbling, and completing their profile, before arriving on their home page with music and event recommendations ready and waiting. You can always revisit these steps, so if you haven’t seen them yet, check them out – the library builder is a lot of fun to play with! In the coming weeks we’ll be making further improvements to the new home page, including the ability to dismiss recommendations. As always, we’re keen to hear your feedback on the changes we make and new features we introduce – please leave your feedback on the forums. Love Music, Love Last.fm, Love Music Videos! We know how much everyone loves music videos and so we thought it was about time we did a better job of surfacing these on Last.fm – making sure we continue to deliver the most complete music resource experience at your fingertips. So today we’re pleased to announce a brand new partnership with our good friends over at MUZU.TV, who will help us bring you over 90,000 music videos across Europe (with more countries to come very soon). You’ll be able to play these videos from both the Artist page, where they’ll be accessible in the same order as the Top Tracks, and also on every Track page where there is video available. So lots of places on the site to get your music video fix! Does it scrobble? Absolutely. We’ve made sure that scrobbling is automatically configured whenever you watch through the MUZU.TV player on Last.fm (for logged in users), and so the more videos you watch, the better your Last.fm music recommendations become. We’ll also be adding scrobbling to the MUZU.TV site soon, so you’ll also be able to scrobble MUZU.TV wherever you watch. 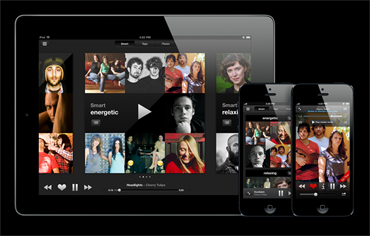 We’re super excited to have partnered with MUZU.TV – helping us bring you a richer experience. 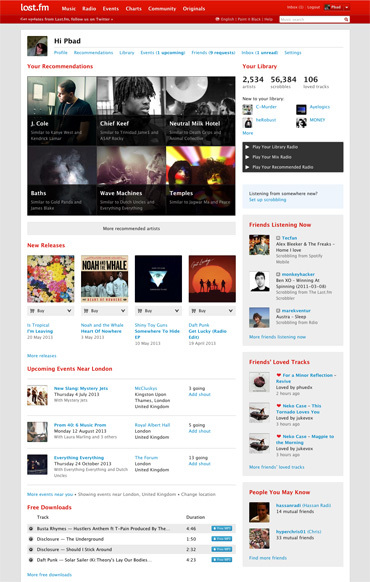 In 2009 Last.fm was proud to partner with our friends at Microsoft to bring music discovery to Xbox Live. Today we’re excited to announce a new update to the Last.fm app on the Xbox 360 platform. The new Last.fm on Xbox LIVE application brings a dramatic facelift simplifying the interface, adding features and including our Originals video library for all to enjoy. The radio options have not changed – you can still listen to artist radio, tag radio, and personal stations (my library, my mix, my recommended), but now it’s easier to jump down the rabbit hole of discovery and launch related stations. Every track that plays shows relevant tags which can launch into a new radio experience. During playback, an artist info button helps you discover similar artists and allows you to launch a new station based on their unique sound. We’ve also added a “fine-tune” option, accessible during playback of personal stations, which allows you to filter what you listen to. Want only your hip-hop recommendations, or heavy metal library tracks? You can do that! It’s a new and powerful way to give you greater control over what you hear! 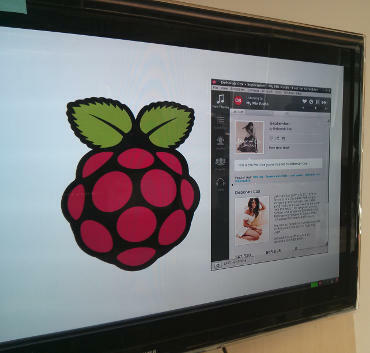 We are also displaying full-screen artist images during playback, giving a cleaner and more beautiful visual experience. 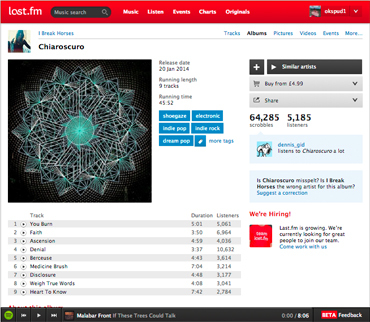 Tune in to your favourite station and let Last.fm take you on the best personalised music experience. With the inclusion of Last.fm’s Originals video content, there are more ways to discover new music. Including exclusive performances and intimate interviews, Originals delivers a blend of new and established artists in unique settings. See live recordings by artists like Big Boi, Emeli Sandé, Minus the Bear, Bastille and Two Door Cinema Club. See exclusive interviews with Phoenix, Olly Murs, Jake Bugg, Ramona Falls and Jason Aldean. It’s a veritable buffet of amazingness. Turn your TV into the world’s smartest jukebox with Last.fm, Xbox LIVE and Kinect. Discover new music from Last.fm’s 18 million tracks and watch hundreds of exclusive videos featuring the world’s hottest artists. The more you listen the smarter it gets. 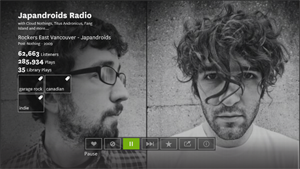 To learn more about Last.fm on Xbox LIVE, visit our hardware and group page. Hello dear users! Fresh on the heels of the all new desktop scrobbler and Scrobbler for iOS, we’ve been hard at work on a new service that we’re announcing today – Last.fm Unplugged! We realise that despite mobile internet and smartphones, a lot of people often listen to tracks on other services that do not support scrobbling or are in places where it is not possible to scrobble via our many clients. That is why we decided about eighteen months ago to develop a new service which can process all other scrobbles. 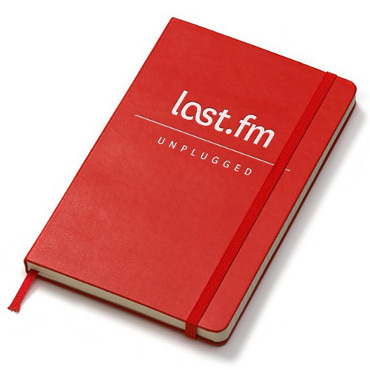 We’re in the process of partnering with Moleskine to produce a Last.fm branded notebook with a special Last.fm micro pencil. Unfortunately this isn’t available yet but until then all you need to do is print out this template, fill out the songs that you listen to and send your completed sheets to Last.HQ! Once we receive your sheets, we’ll then attempt to scan them – and if that fails, use our troop of monkeys to manually enter your scrobbles. Scrobbles must be handwritten in order to prevent scrobble fraud. You’ll never miss another scrobble thanks to this game changing new service! For all developers out there, Last.fm Unplugged is written in a combination of Visual Basic 6 and Lisp – combining the rapid turnaround time of BASIC languages with all the power of a list processing language. You can download the template here. Ten years ago was a boon-time for MP3s. I remember ripping my first CD, thrilled with the prospect of storing my ever-expanding collection on a computer instead of taking up precious space in my cramped apartment. 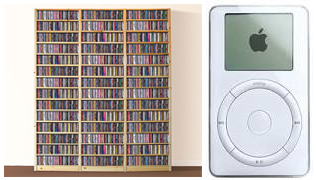 The shelves of CDs started collecting dust, my Discman gave way to MP3 players, iTunes was born and then the iPod allowed me to carry 1,000 songs in my pocket! Eleven years later, I have transferred my music library between many computers, over dozens of portable devices and now in the ether of a cloud. My digital library has been a constant companion, traveling the world and growing with me. I love my library! Recent developments in streaming services are making the maintenance of a digital collection obsolete. Seemingly endless libraries are available for monthly rental, and internet radio services like Last.fm offer unlimited personalised streaming. There are so many new ways to listen to music now, that I sometimes forget about my carefully curated digital library. It is with this in mind that the Scrobbler for iOS was created. 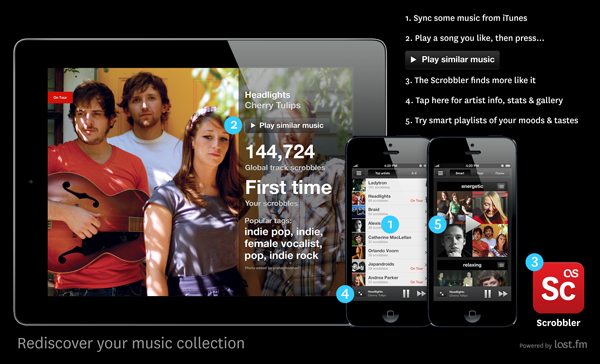 Introducing the Scrobbler for iOS, an iPhone and iPad application that not only natively scrobbles, but gives you several ways to re-discover your digital library. We’ve long known that scrobbling iPhones has not always been a seamless process, so we wanted to create an application that alleviates this pain. We also wanted to offer our users with something new, so we built playlisting services that get applied to your digital library. For the first time, the algorithms that power Last.fm Radio can now be applied to the libraries you’ve spent years curating. Every track in your library can be used to discover other, similar tracks. We use the power of machine tags and the knowledge of social tags to help you re-connect with the music you love. Download the app here and join the group to keep up to date with announcements, forums and help. I think you’ll agree that they’re all songs that you hear a lot of during December and not a lot during the rest of the year. With that in place, I attempted to answer an age old question suggested to me by our good friend and Last.fm founder RJ, “Does Christmas really get earlier every year?” – a question which refers to the perceptual creep of seasonal products, music and decoration further and further towards the summer each year. 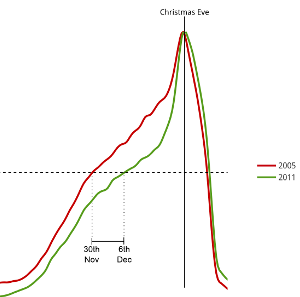 I normalised the scrobble volume in the run up to Christmas by the Christmas Eve volume for each year to yield a comparable listening curve for each year. 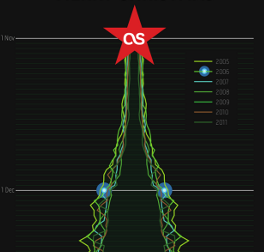 I chose the point at which listening volume becomes 50% of the December 24th volume to call “the start of Christmas”, then compared that date across all the years for which we have complete and reliable scrobble data (2005-2011). 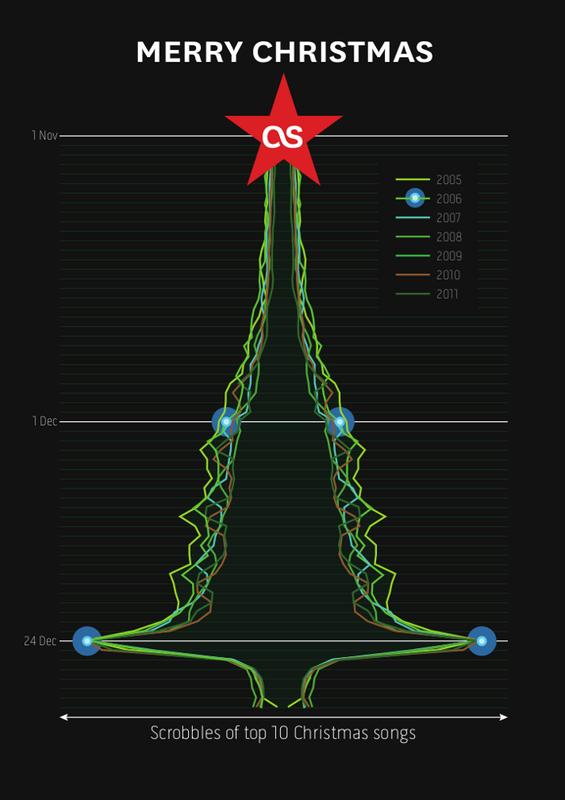 During the initial graphing for the above, Elliot noticed that without the 7-day moving average the graph looked a little like a Christmas tree on its side with the day-of-week variation creating the branches. Pursuing this I made a concept for a “Scrobble tree”, which I then handed to Graham – one of our design team – and he worked his magic to produce this awesome Christmas card. 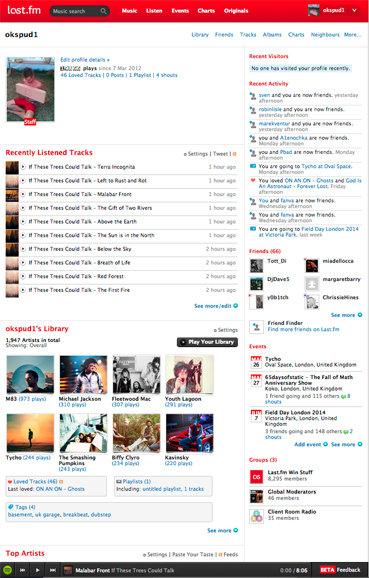 If that’s not enough festive cheer for you, then you should check out last.fm/christmas created by web developer Marek. It shows data about the current Christmas music being listened to and a live indicator of what percentage Christmas it is right now.